Ministers Syda Bbumba and Professor Khiddu Makubuya bowed to pressure and resigned from cabinet for their role in the irregular compensation of more than 150 billion shillings to city businessmen Hassan Basajjabalaba and Col. John Mugyenyi. Bbumba, the minister of gender and social affairs and Makubuya in charge of general duties in the Prime Minister’s office, on Friday gave personal statements on the floor of Parliament but denied accusations of corruption and abuse of office. Bbumba said she did what she thought was right as minister of finance at the time. Makubuya on his part said there were a number of people who did not want him to be a minister. 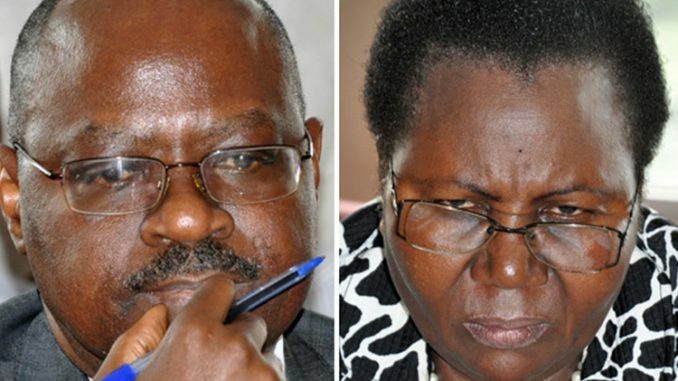 Earlier, the deputy leader of government business, General Moses Ali announced that the two ministers implicated in the Public Accounts Committee report were no longer part of cabinet. He told MPs that the two ministers had taken political responsibility and decided to resign from their posts. Ali noted that President Yoweri Museveni constituted a committee to study the Public Accounts Committee report on the compensation Basajjabalaba and retired Col John Mwesigye. The two businessmen demanded compensation after their attempts to take over city markets were blocked. The committee by the president was in agreement with the PAC report and found the minister culpable. Ali noted that the committee found there was financial loss occasioned in the transactions. Ali said the Bank of Uganda Governor, Emmanuel Tumusiime Mutebile was not in the country so cabinet would not take a decision without his knowledge. PAC report called for the two ministers and the central bank governor to resign. The MPs also called on the Inspector General of Government and Criminal Investigations Directorate of the police to investigate the matter further. The report blamed Prof. Makubuya for failure to stop the inflating of payments from Shs131.7 billion to Shs142.6 billion to Haba Group. When the former Attorney General met PAC, he testified that he was only acting on the orders of the President. Bumba was blamed for failing to make due diligence on the same compensation.